"If I die, will you remember me forever, Kenshin?" ADV brings the final installment in the Rurouni Kenshin saga, Seisouhen as the two part OVA, Samurai X: Reflection. 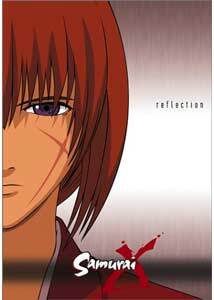 Where the first four-part OVA (comprising Trust and Betrayal) formed a prequel to the 95 episode TV series, Reflection provides the coda. Picking up fifteen years after the end of the television series, Kenshin and Kaoru have been married and have a teenage son in Kenji. Life hasn't been blissful, as Kenshin is still haunted by the demons of his brutal past, still trying to find atonement for the thousands he has slaughtered as the Hitokiri Battousai. Called upon by the new government to lead a new generation of fighters on the continent, Kenshin has left his wife behind, and she dutifully waits for his promised return. In his absence, the illness both are stricken with begins to worsen, aggravated by the emptiness her life holds without Kenshin. The first episode opens with an image of Kenshin sinking into the depths of the sea, resigning himself to his death, as the reward for his life as the land's most feared and effective assassin. Despite the length of time Kenshin has been away, Kaoru holds out that he will come home, their bond unshakable, even in the face of constant peril. Through flashbacks, we see the building of Kenshin and Kaoru's relationship, from Jin'e Udou's attempt to reignite the killing instinct in Kenshin, to Enishi's kidnapping of Kaoru to avenge his sister's death at the hands of Kenshin and excursions to the Kyoto arc. Familiar faces return, older, and with new missions, as the final reuniting of the show's characters unfolds. Like the prequels, the mood of these OVAs is dark and somber, and the title Reflection appropriate for the spirit of their content. They provide an additional glimpse into the main characters, redefining and reaffirming the relationship between Kaoru and Kenshin, while looking back on the events that shaped their lives. There is no cuteness or humor here, this is a serious drama about loss, reconciliation and commitment. There are a few good battle sequences, but these aren't really the focus, more a result of the personalities involved. The thrust here is expanding on the depth of the characters, approaching things from a different perspective, and bringing the elements that formed the epic of Rurouni Kenshin together. Like the prequel OVAs, the animation and design style is more mature, lending a different feel to the flashback sequences, and the look is wonderful. Those unfamiliar with the story will likely be lost in places, especially with all the jumping around in the timeline, but unlike the TV series, this does provide some closure. On its own it may prove overly dramatic and indulgent, but in context has a rightful place in the series. This is definitely not the place to start, however. Image Transfer Review: Presented in a 16x9 anamorphic transfer, the look here is pretty much gorgeous. Colors cover a wide range of intensity, and all come off very well, from pastels to punchy blues and reds, and black levels are also solid. There is some degree of aliasing and shimmer, but aside from that there is little to complain about. Audio Transfer Review: Stereo audio is excellent, providing an immersive atmosphere. The tracks are full with a moderate amount of directionality and a wide sounstage, center anchored dialogue clear and easily discernable. Taku Iwasaki's orchestral score blends nicely, carrying the mood of the show well. English dub audiences get both a 2.0 and 5.1 track, the latter understandably being more enveloping, but still firmly situated in the front channels. No technical issues were noted. Extras Review: Four chapters are provided per episode. Full or sign-only subtitles are available. A few spelling errors were noted in the full-length track. The principle extras here are on camera interviews with the seiyuu. There should be a dozen in total, six for each of the two OVA parts, running two and a half to five and a half minutes a piece. Unfortunately, there is an authoring error (at least on our disc, verified on three players) that eliminates four of these. Mayo Suzukaze (Kenshin) and Miki Fujitani (Kaoru) provide a seperate interview for each the two parts, while Mina Tominaga (Yahiko), Yuji Ueda (Sanosuke), Shuichi Ikeda Seijuro), Akio Otsuka (Jine), Nozumu Sasaki (Enishi), Yuki Kaida (Kenji), Mika Doi (Megumi), Yuri Shiratori (Tsubame) comment on their roles in a single OVA�or at least they were supposed to. Selecting the Ueda, Ikeda, Kaida or Doi interviews (the fourth and fifth on each screen) replayed the Suzukaze interview from that screen. The sound quality isn't all that great, but it's nice to see the faces behind the parts. The clean closing animation is included, along with a production sketch gallery, which plays as a 2m:51s slide show, set to the credit score. Previews include The Devil Lady, Noir, Rune Soldier,Samurai X: Betrayal & Trust Director's Cut, Voices of a Distant Star, and Crying Freeman. As they did on their previous Samurai X titles, ADV has provided a reversable cover. Samurai X: Reflection provides a fitting finale for the series in this two-part OVA, further deepening the characters, and putting the saga to rest. While it plays fairly well on its own, this will be of most value to those familiar with the entire TV series. At the very least, viewers should have seen the original OVAs, which are more in tune with the tone of this release. Recommended.